← St. Irenaeus Heretic Fighter. Captain Myles Keogh was from the little village of Leighlin Bridge, Co Carlow Ireland where my favorite deacon is from. He may or may not be a distant relative. Captain Keogh fought for the Papal Army and eventually he signed up with the Union Army. He fought with Custer and ended up dying in the battle of Little Bighorn. The only survivor of the battle was the Captain’s horse Comanche. 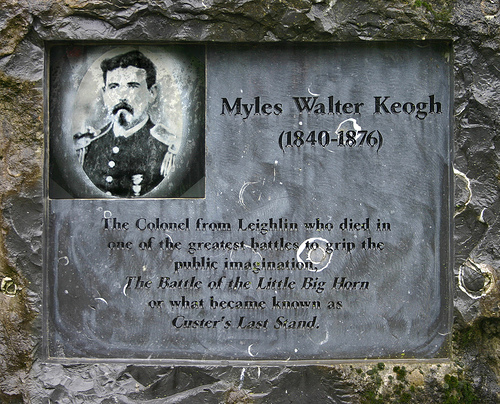 The photo above is of the memorial to Myles Keogh in Leighlin Bridge. Pat MaNamara has a post on the Irish Captain. There are some nice photos of Leighlinbridge and some commentary on Myles Keogh here. This post is in honor of my husband for his Birthday. Myles may or may not be a relative. But that didn’t stop my favorite deacon for insisting on taking a detour, on a trip in the early years of our marriage, to visit the site of Little Bighorn battle. He wanted to see the monument with the name of Keogh on it. This entry was posted in Catholic and tagged Famous Irish, Little Big Horn, Papal Army. Bookmark the permalink.